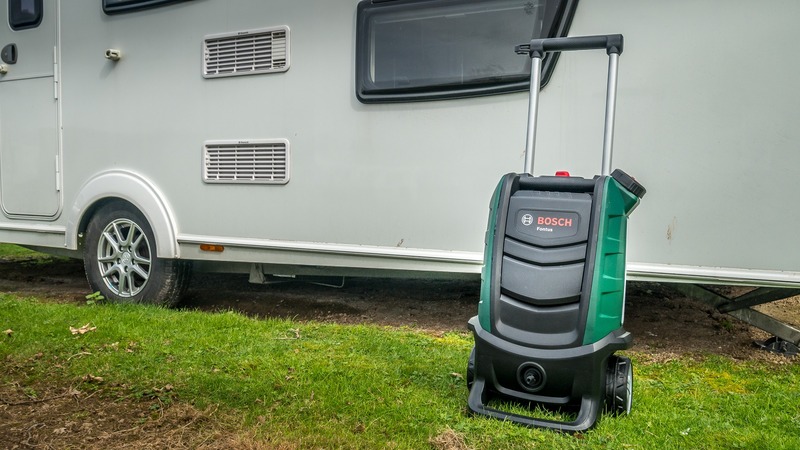 The Bosch Fontus is a cordless, and hose-less, powered cleaner that’s ideal for cleaning your caravan, bikes, muddy boots, and even your dog’s paws! We put it to the test. 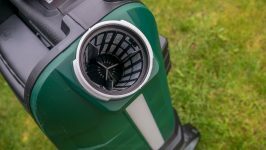 Bosch reached out to us and asked if we’d be interested in testing out their Bosch Fontus to see how practical it is for cleaning outdoor gear. 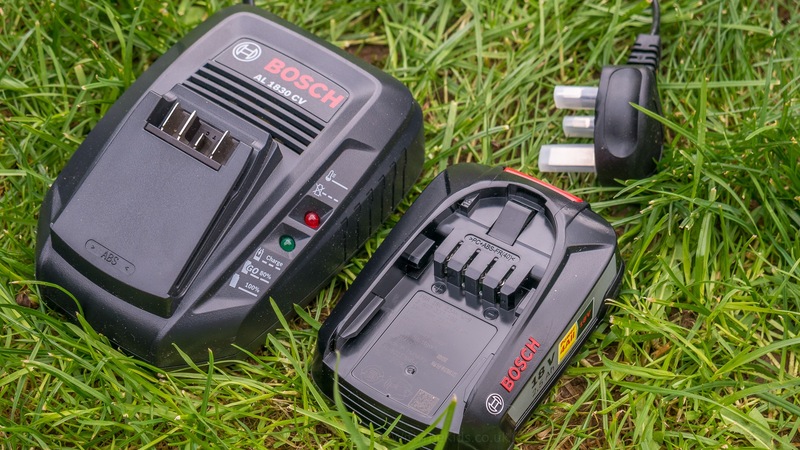 Now, this isn’t the sort of equipment we normally review, but the Bosch Fontus is different: it’s cordless. 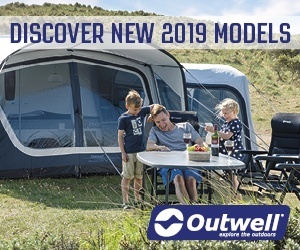 My first thought was that the Fontus would be brilliant for those of us with caravans in storage, as there is usually no power and no water at a lot of caravan storage facilites. Having something you can pop in the car to give the caravan a quick clean after a trip would be extremely useful. So that’s what I did…. 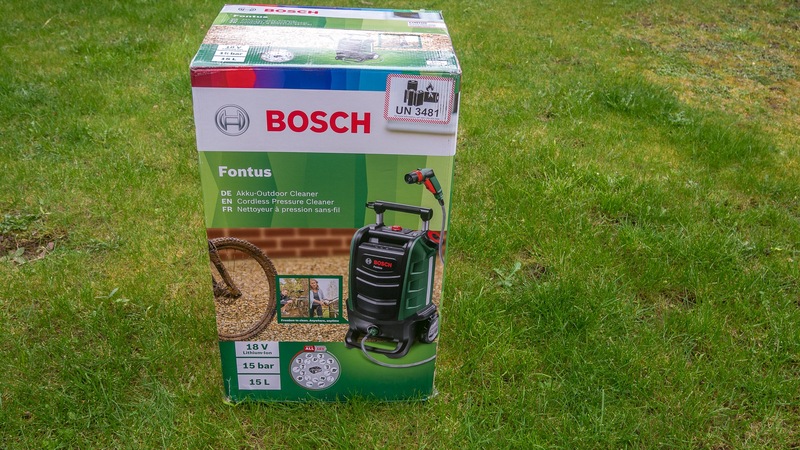 Bosch loaned us a Fontus for testing, and I was pleasantly surprised to see that we were the first people to use this as a brand new Bosch Fontus arrived in its box. You don’t need to assemble much to get the Fontus working. 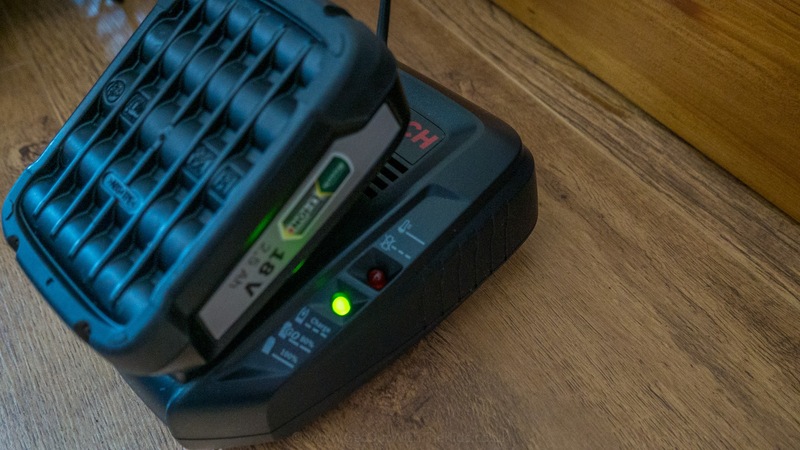 You must give the battery a full charge before the first time you use it, but since the battery comes partially charged, this doesn’t take long. Charging the 18V battery. This didn’t take that long. The hose and the nozzles are all stowed on the Fontus, so there’s no need to go rummaging around to find any missing accessories. 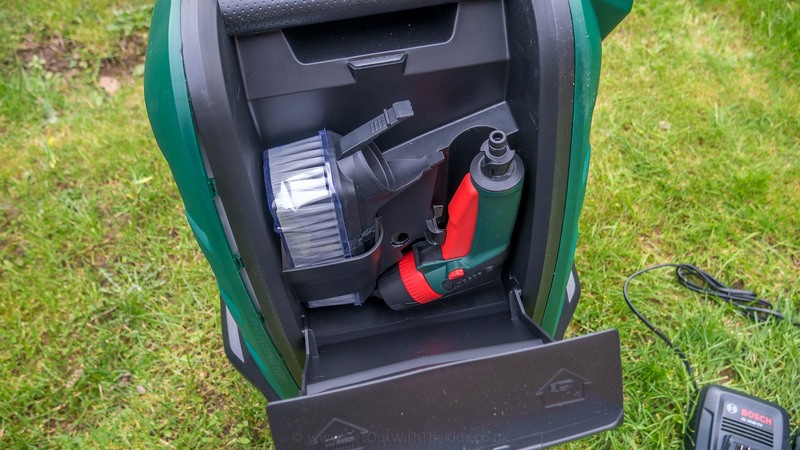 The nozzle and SmartBrush are stored inside the Fontus. I really like the design of the nozzle and brush. 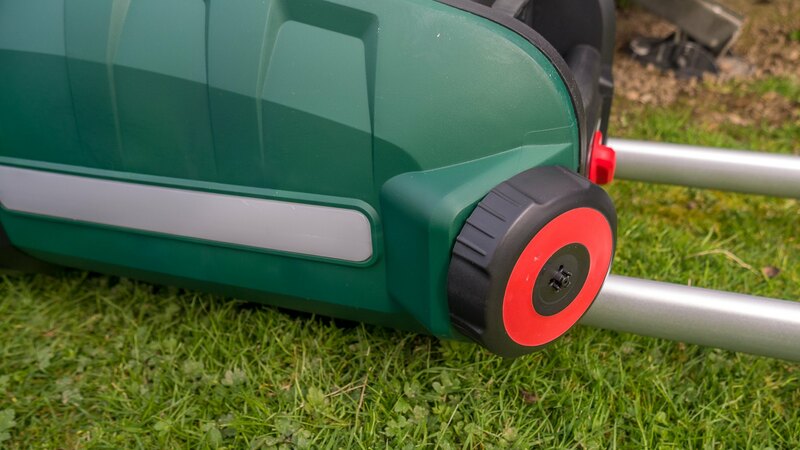 The nozzle has three spray settings and the brush clips over the front of the nozzle. The design of this nozzle and brush combination is excellent. 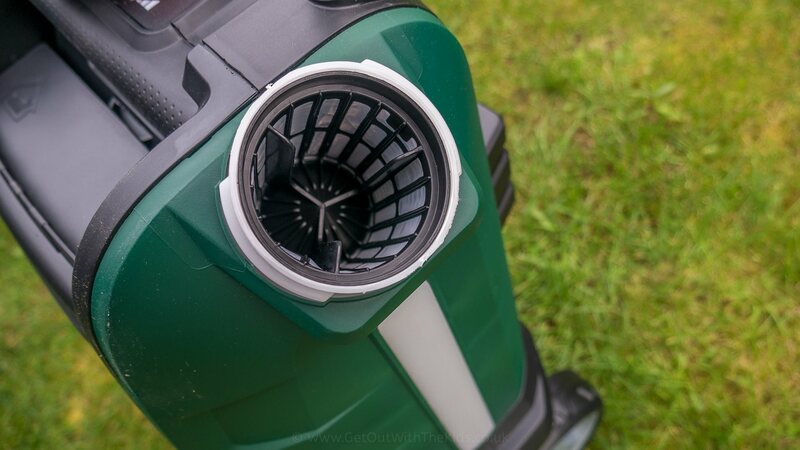 When attached, the Fontus can deliver a little water to help cleaning, you can squeeze the trigger to spray a jet of water on stubborn dirt, and then you can stand back and just direct the nozzle to spray off the dirt without even needing to remove the brush. 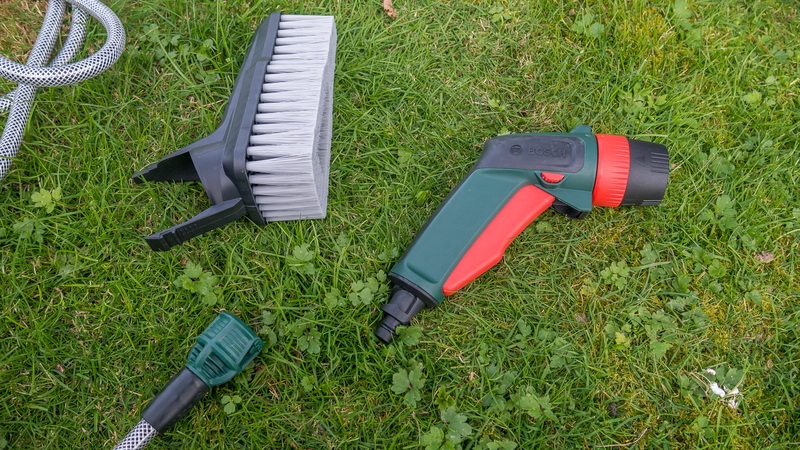 The nozzle and SmartBrush that fits over the top of the nozzle. 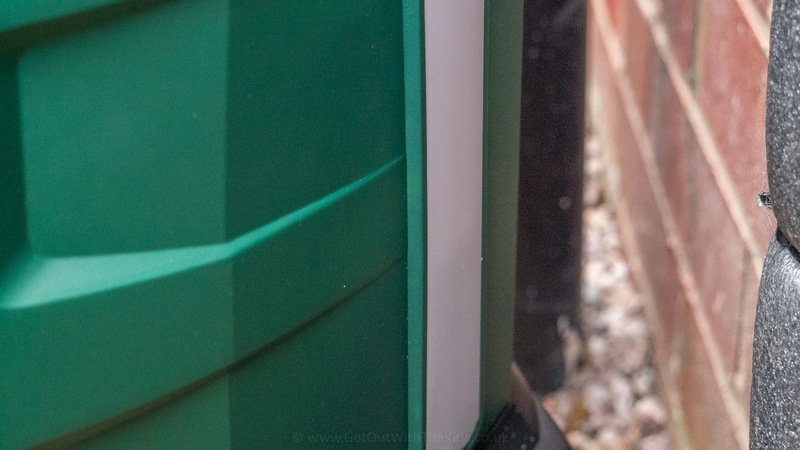 Filling with water is also very easy as it has a wide opening and can stand underneath an outside tap. There’s an indicator on the side to show how much water is in the tank. 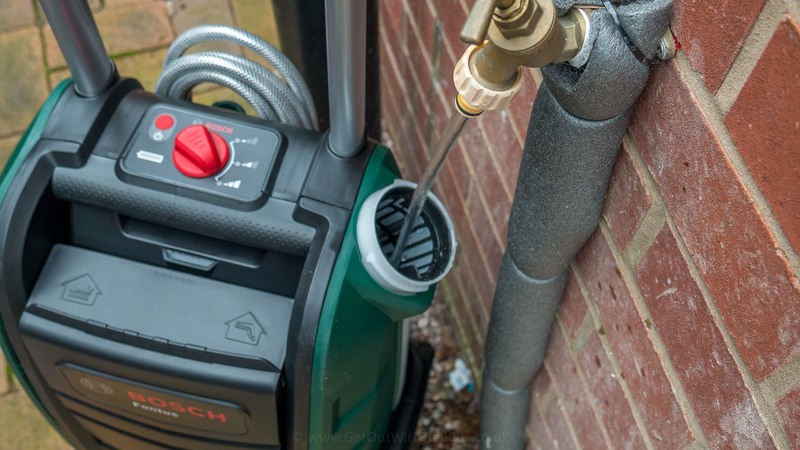 Filling the Bosch Fontus with water from the outside tap. 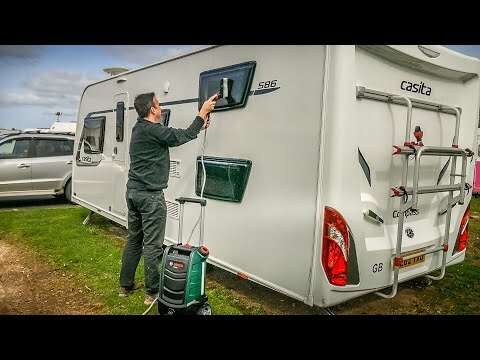 I charged and filled the Fontus and took it down to where our caravan is stored. I stood the washer upright in the boot of my car, and despite several roundabouts and speed humps, the Fontus was stable. I also tested it lying flat with a full tank of water, and nothing leaked, and so it looks like transporting it with a full tank works OK. 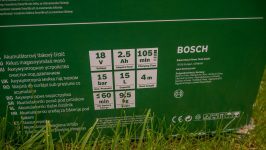 The Bosch Fontus managed to stay upright when being transported in the car. Laying it down on its side with a full tank of water saw no drips come out. 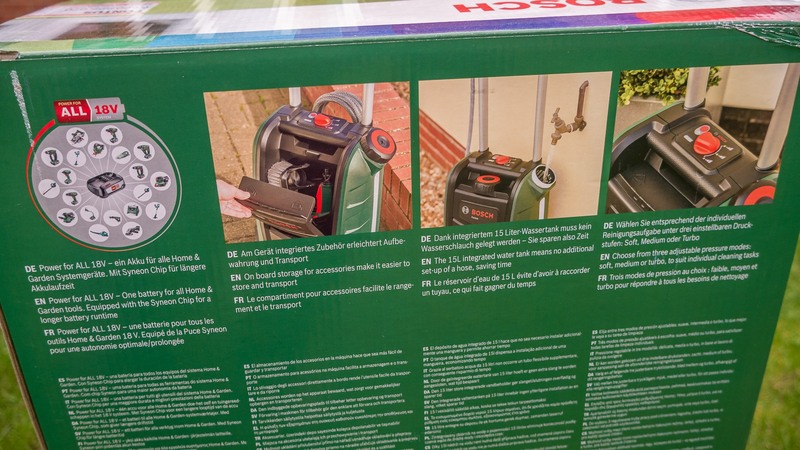 Since this is cordless (and hose-less), you are limited in power and water supply, so this isn’t a device where you just stand back and blast whatever you are cleaning. That approach is often not the best for cleaning many things anyway, as a powerful waterjet can cause a lot of damage. 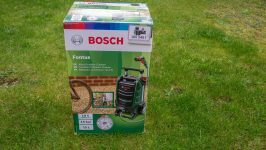 Instead, with the Bosch Fontus, you use the brush with a bit of water and spray off afterward. 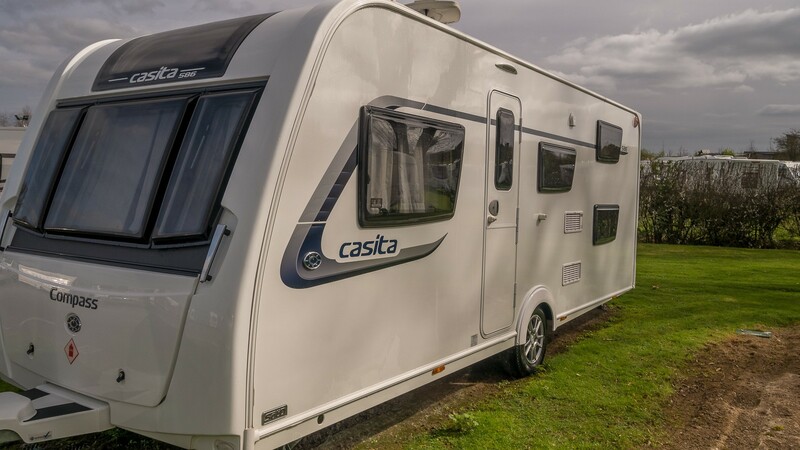 Our caravan had been cleaned with a proper caravan wash not too long ago but was soon looking dirty again from being towed. 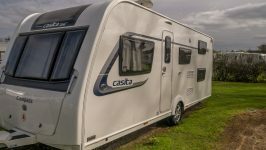 It didn’t take me too long with the Fontus to get the caravan looking as good as new again. 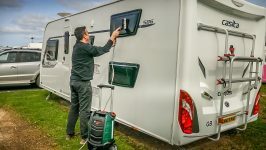 Using the Bosch Fontus to clean our caravan. I had used just over half the tank of water by the time I had cleaned half the caravan, so I was interested to see if it would last the whole van. Fortunately, it did.  However, if your caravan is somewhere where there isn’t a tap, then you might want to take some extra water with you. 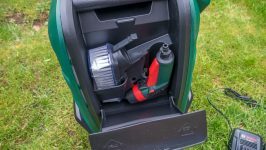 After using the Bosch Fontus, I soon realised just how practical it was. I’ve always found traditional mains power washers a bit of a pain, with lots of cables and hoses to drag around. However, this is a breeze to use. Don’t think of it as a mobile power washer though. 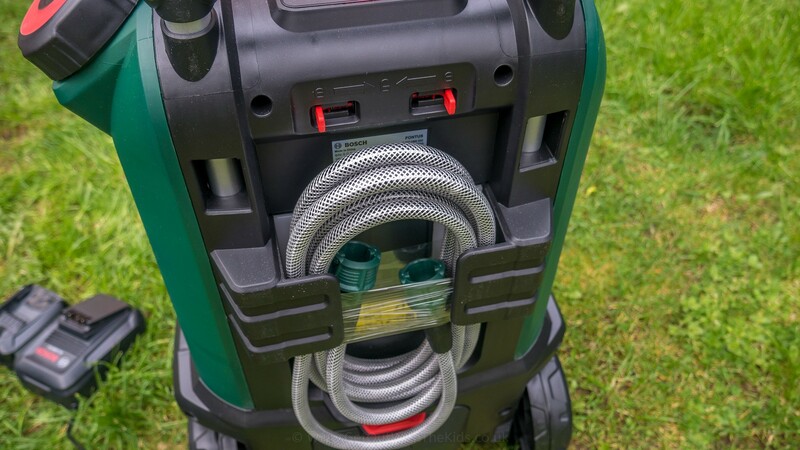 It’s more like a portable hose, which makes it usable for a whole range of things. I found I could clean things that just wouldn’t be practical with a hose nor a power washer. 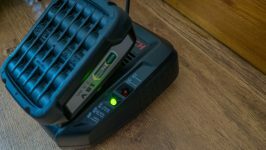 With the low power setting on the Fontus (which has three pressure settings) and the right nozzle spray, it’s safe enough even to wash your dog’s paws. I would consider taking it in the boot of the car just to clean the dog off, and the wellies, after we’ve gone on a muddy family hike. This would save us having to call the EMT, the ‘Emergency Mud Team’, when we get home to get the dog upstairs for a bath without getting mud all around the house! There are three power settings. 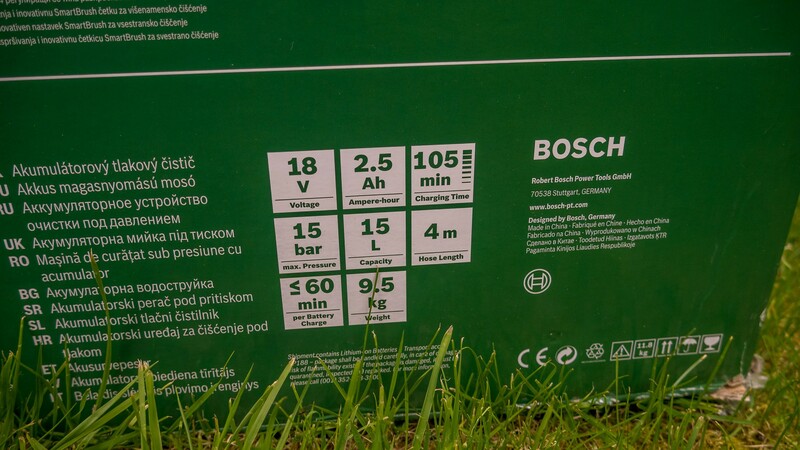 Here are some things I really liked about the Bosch Fontus. 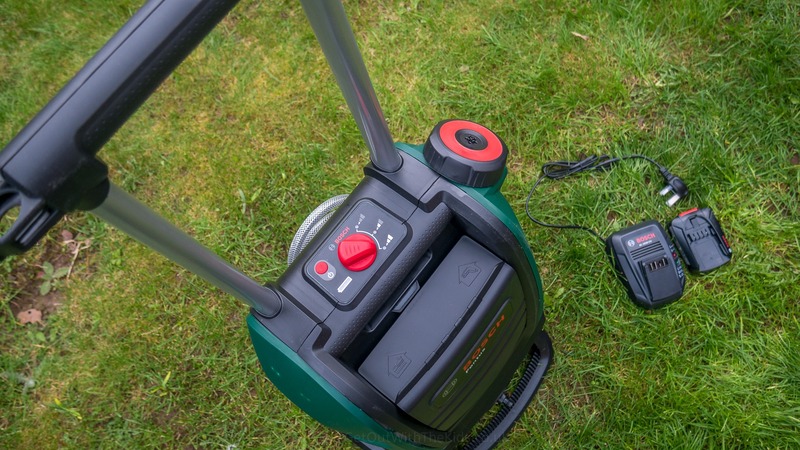 It’s very quick to use as there’s no messing around with hoses and power cables. Just fill it up and go. It’s lightweight and easy to move, even when full of water. This means I could get into places that would be difficult on a power washer with a hose attached. The combined brush and nozzle are a great design and make cleaning very easy. The wide filler cap makes it very easy to fill. It’s fast to charge. I timed it about an hour to recharge and only had to recharge once in a day of cleaning. The hose is a good length. I was able to stand on the top of a step ladder to clean with the Fontus still on the ground. What I didn’t find so good. I love the brush design, but you need to be careful as the black plastic can leave a mark if you accidentally scratch a white surface with it. 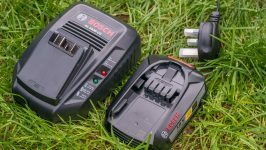 The Bosch Fontus is not so good if you want lots of power. This is battery powered and so only 15 bar. It’s like a very good hose on good water pressure. If you need very high power for tough jobs like cleaning paving, you’ll need a mains power washer. 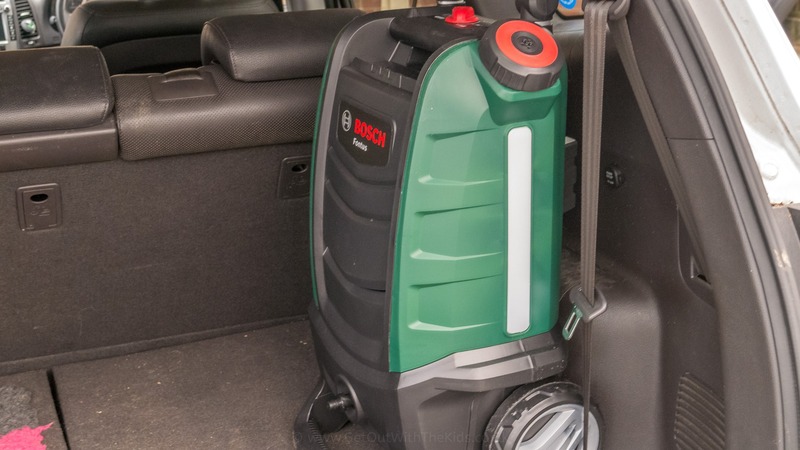 The Bosch Fontus is ideal for cleaning things that are best on a lower power – like bikes, caravans, etc. It only holds 15 litres of water. If you are used to just spraying water all the time, you’ll soon run out. 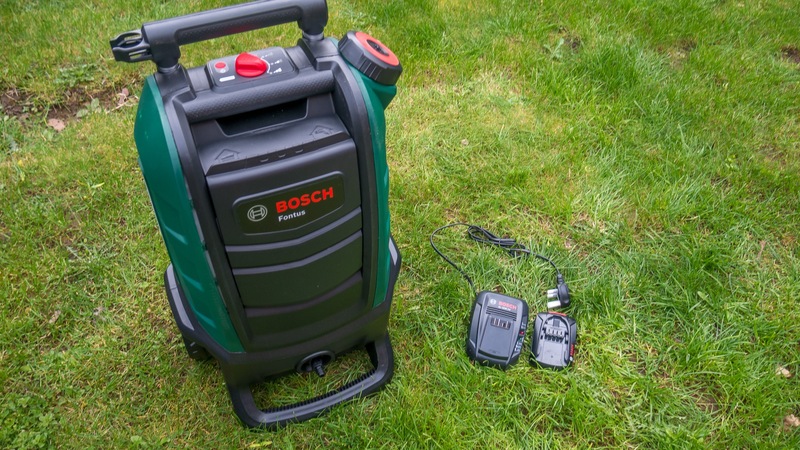 Use water sparingly with the Bosch Fontus. 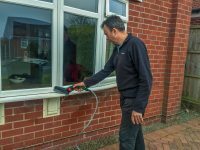 Use the nozzle and brush to clean, then spray off for example. It’s not a device for just continually spraying. 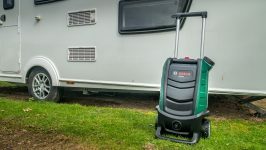 Despite the high price tag (yes, you can get cheaper mains-powered washers), and you could be very cynical and thing a cordless power washer is a bit of a gimmick, but I really like it. 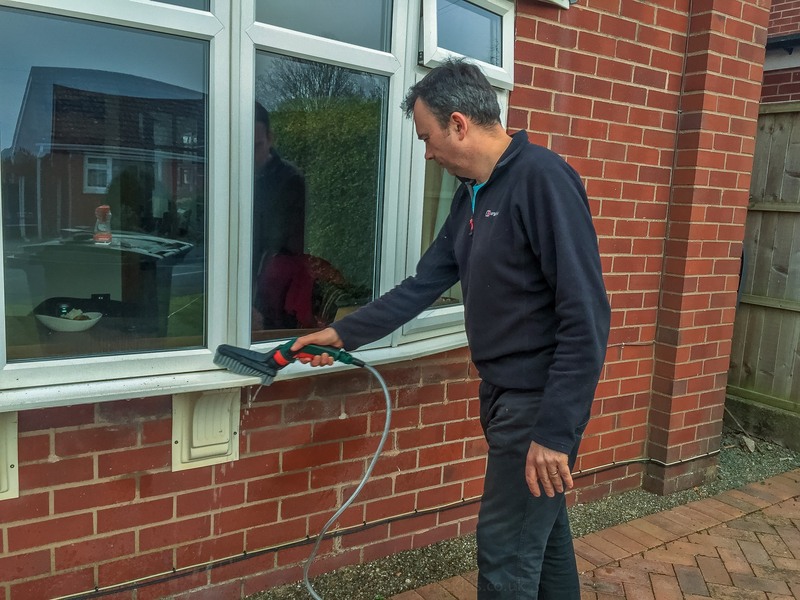 After cleaning the caravan, which I managed to do on one fill of the Fontus, I took it home and gave it more of a test, going on a bit of a cleaning spree: windows, garden furniture, the car, the garage door, and even the porch over our front door! I couldn’t help but test it out on a few things at home too! 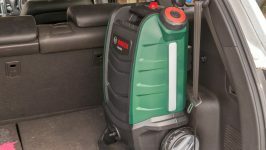 The fact that it’s so portable and also that it isn’t high powered means that the Fontus is convenient at cleaning all sorts of things. I am certainly sorry this test product go back to Bosch. 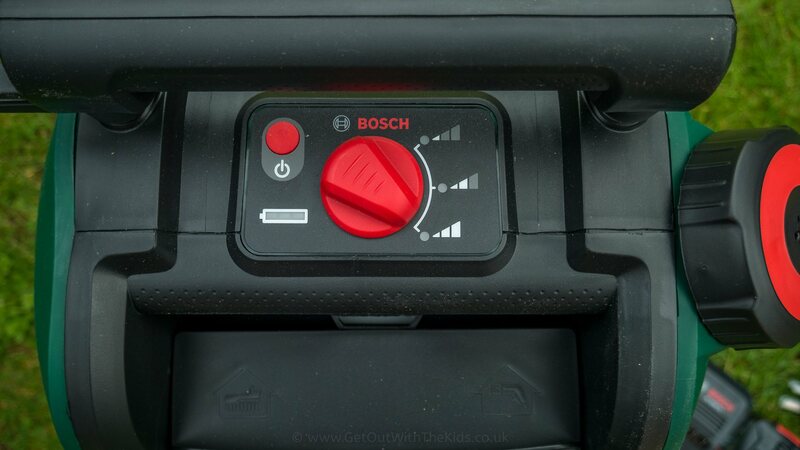 I give the Bosch Fontus the Thumbs Up award. 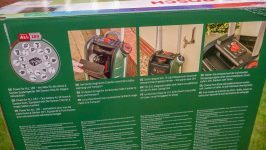 Click here for specifications and user manual. Much easier to clean places that a normal washer is hard to get to. Well designed & good quality. Can do a number of washes on one charge. Pricey, but after using it, found this a very good bit of kit. 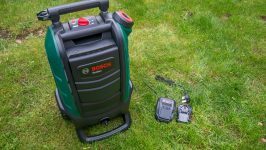 It's portable so you are limited with power and water capacity.